Willy likes to swim under the water. Molly is getting ready to dive from the high board. It looks higher from on top of the board than it does from below. 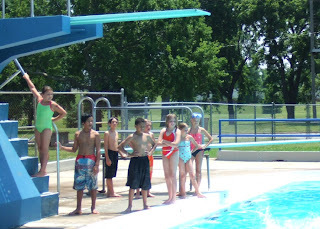 Molly is waiting her turn at the high diving board. She is 3rd from the right wearing a red swim suit. 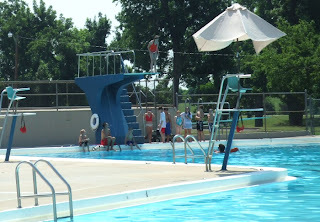 Molly and Willy are taking swim lessons at McClure Park for the 2nd week. Molly has learned the butterfly stroke and Willy has improved his ability enough to be in the intermediate group with Molly. 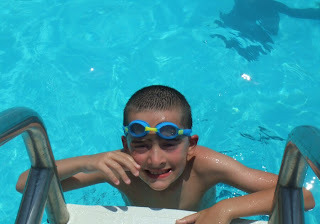 They are having fun and becoming better swimmers. Luke's girlfriend Cara has her son Joshua for most of the summer. 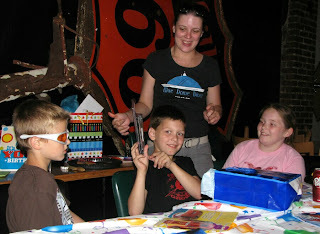 He celebrated his 9th birthday today with a Nerf Gun party at the Blue Dome Diner. The restaurant closes at 2:00 and the party started at 2:30. Josh got some presents. We gave him a nice Magna Lite flashlight. 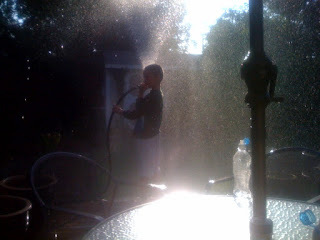 Every boy needs his very own flashlight. 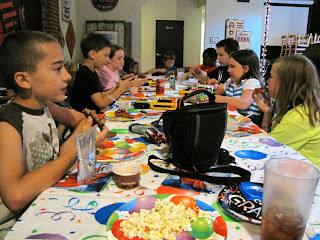 Then we enjoyed cake and ice cream. 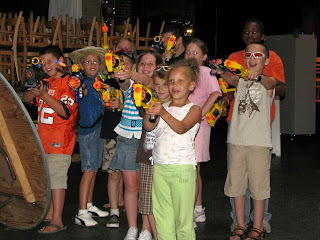 The funnest thing they did was have a Nerf Gun war. 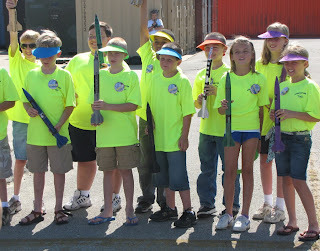 The kids were told to bring their nerf guns There were extras in case the kid didn't have one. In case you don't know, a Nerf Gun is a toy gun that fires little sponge rubber "bullets" about the size of a small tube of lipstick. The banquet room of the restaurant has lots of tables and chairs and places to hide and ambush each other. They ran around and had a good time. Have a piece of David and Renee's wedding cake. It is an easy one this morning. 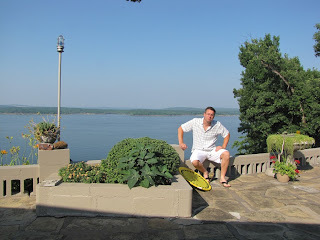 The wedding reception was at the home of David's Aunt and Uncle who have a beautiful place overlooking Fort Gibson Lake near Wagoner. David let me take his picture against the view from their patio. Everything was very nice. Here is the handsome couple. 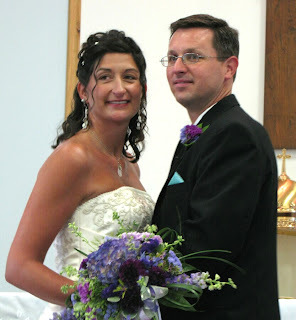 Introducing David and Renee Miller. The wedding party from left to right are Renee's daughters Katy and Gabby, her sister Christine, Renee, David, and David's brothers Adam and Luke. My 3 sons are looking good. Today is an exciting day for us. It is my son David's wedding day. 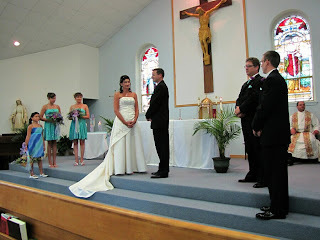 My son David is to marry a young woman he has known since high school. Renee has two daughters 9 and 12, and is very sweet, very pretty, and a excellent cook. David has waited until he is 40 to marry, and Renee is definitely worth the wait. I predict a happy union. Photographs will follow. 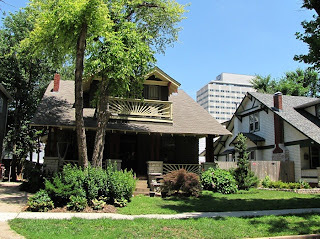 News item number 2 is that I have started a new blog called "Historic Tulsa". Tulsa is an interesting city with an interesting history. While I have made a few posts about Tulsa history I have decided there is more than enough really interesting stuff to warrant its own blog. 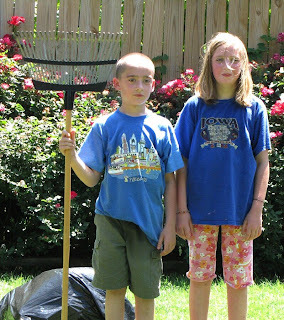 I started it by pulling over the historical items from this blog and then added a few new items. Take a look and please leave a comment. It would be great if you were to sign up as a "follower". I intend to continue posting to this blog just as before except the historical items will probably go to the new blog. 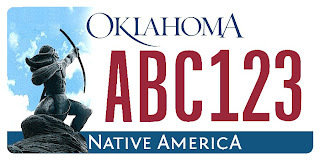 Beginning January 2, 2009 the new Oklahoma automobile license tags will have a new design. The new plate features the Sacred Rain Arrow sculpture by Oklahoma artist Allan Houser (1914-1994). 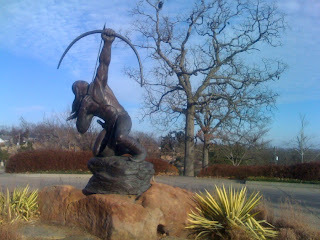 The original of this statue stands at the entrance of the Gilcrease Art Museum. 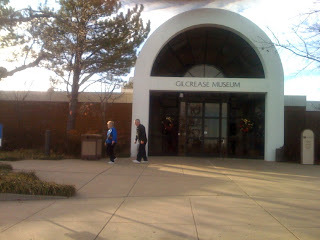 Gilcrease Museum of the Americas has an outstanding collection of art by and about Native Americans. I need to do a post about this wonderful museum. In the meantime, you can read about it HERE. The high temperature today in Tulsa is 100F (37.8C). A couple in Owen Park beats the heat with a cool snuggle. 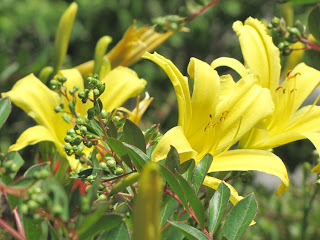 This rich yellow day lily is blooming in my front garden. These are a lovely rose pink. A stand of classic orange day lilies share a bed with bright red cannas. 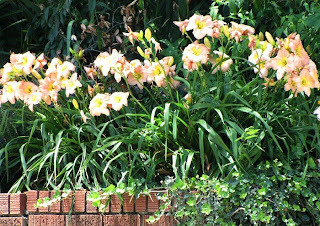 Early summer is the season for day lilies. These hardy perennials grow from tubers and will spread over a larger area each year if given some room. They are beautiful for several weeks then devote themselves to growing and storing up energy for the next year. They are remarkably hardy and propogate easily from a start. During the dust bowl and depression days many Oklahoma farmers abandoned their homes and migrated west. Today the only signs of these homesteads are crumbling foundations and bright orange clumps of day lilies planted long ago and still thriving. 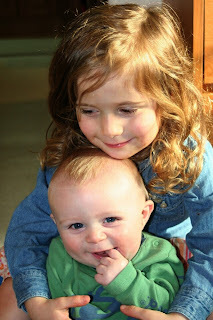 Autumn likes her little brother. She is only slightly jealous. 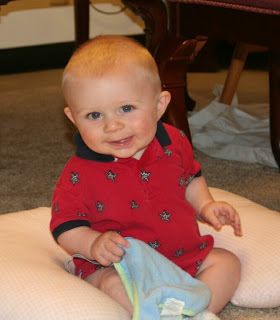 Grant is 8 months now. He is pulling himself up and wants to walk but does not quite have the hang of it yet. It won't be long. 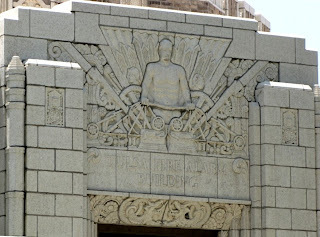 The Tulsa Fire Alarm Building is a historic Art Deco building in Tulsa, Oklahoma. 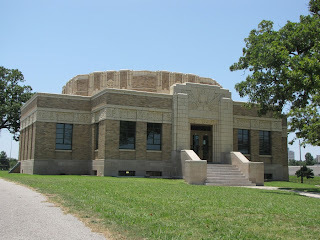 It was built in 1931 and served as the central reporting station for the Tulsa Fire Department. Fires were reported from alarm boxes spread around town to this building and the firemen in this building would alert the fire station closest to the fire. At the time of its construction this system was the best available alarm system. The building was used by the Tulsa Fire department from its construction until 1984 when it was left vacant and fell into disrepair. 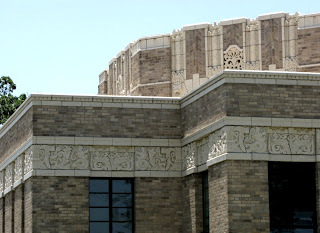 In 1994, it was purchased by the Tulsa Preservation Commission. In 2000, the The American Lung Association of Oklahoma purchased the building as its new headquarters. After a $5 million fund-raising campaign, the renovation of the building was completed in 2005. The building was listed on the National Register of Historic Places in 2003. 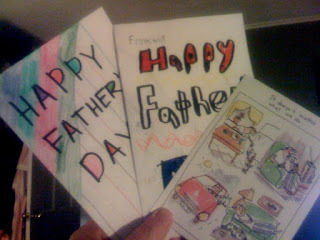 I had a wonderful Father's Day. Susan served me breakfast in bed and presented me with Father's day cards hand made by Molly and Will, and another from Smokey. We went to church at our friend Greg's church, came home and took a nap. At my age that's about as much excitement as I can stand. 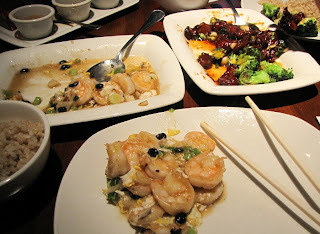 We had a late lunch/early supper at our favorite Chinese restaurant P. F. Chang's. 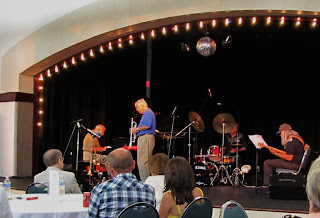 Then a great concert at the Jazz Depot. The David Teegarden Quartet with Mike Moore on trumpet, Kenny Quinn on piano and Bucky Young on bass. Excellent! I had a great day. We attended the Gilcrease Hills Baptist Church this morning to see our friend Greg West receive his EFM certificate from Maggie and Keith. Greg is the pastor of this church and preached an excellent sermon. Special music was presented by the children's choir. I just realized that I posted no jigsaw puzzle last Sunday. To make amends I will post two this Sunday. I hope you enjoy them. Some of the beautiful decorative work on the tower of the Boston Avenue Methodist Church, Tulsa, Oklahoma. 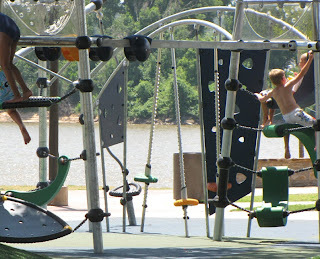 The new park at 41st and Riverside is crowded every day. It is a nice place to let the kids play while the grownups picnic and chat. 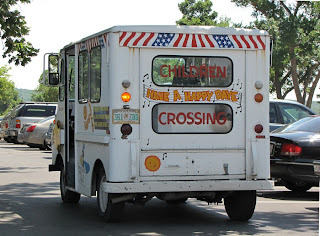 The weather is warming up and the ice cream man is always welcome. 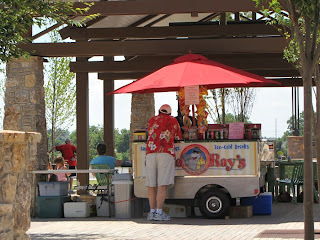 If you forgot to bring something to eat Ray will provide you with a hotdog or a nice sandwich and a cold drink. It is a nice place. 3 - 2 - 1 - Blast Off ! 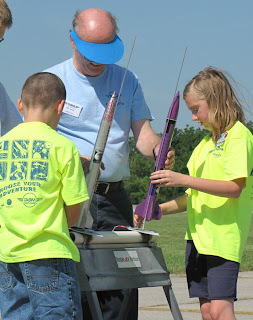 Today is the day that the kids get to fire the rockets they have been working on. Their father Jeff drove down from Missouri on his day off and we went to watch the fun. Lots of eager young rocket scientists. 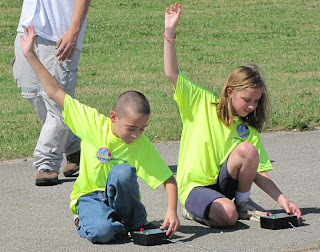 Willy and Molly slip their rockets over the stabilizing rods. 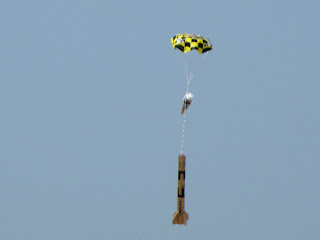 The first stage sends it high in the air, then another pop and the parachute is deployed. And they run down range to retrieve their rocket for another firing. They are having a great time this week. This is Cheyenne Avenue just South of 15th Street. 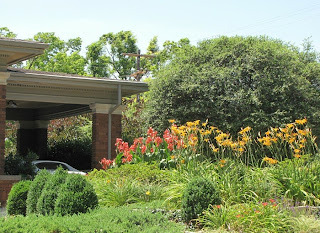 This lovely old residential area is almost in the middle of downtown Tulsa. 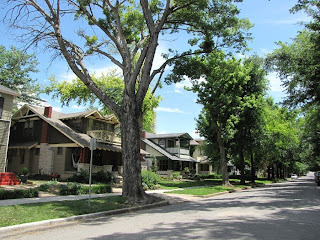 It is typical of neighborhoods built prior to 1920 with solid homes on tree lined streets. 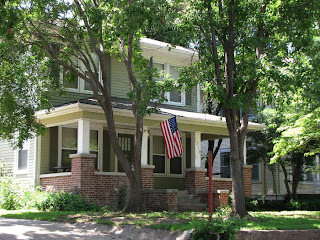 Big front porches, flags, and sidewalks are of an older time when prople walked around after dinner and visited with their neighbors. This photo was taken in 1913. 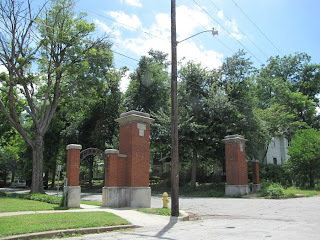 The brick pillars and wrought iron arch were built in 1909. The pillars are still standing but the arch is gone. Most of the old houses are still here. Because it is so close to the center of Tulsa it is a very desirable place to live if you work downtown. We think we are close to down town but we are 3 miles south of here. We were out in the country when these houses were built. Now we are "mid-town". 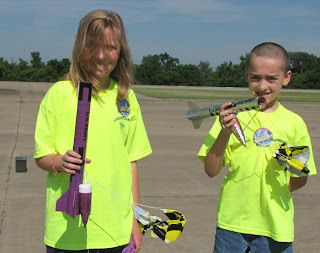 Molly and Will are attending "AeroSpace Camp" at the Tulsa Air and Space Museum. They are learning a lot and having a great time. 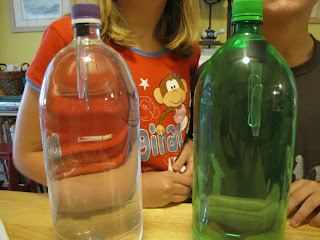 Today they studied Boyle's Law of Gases and made a Cartesian Diver as a demonstration. You may notice that Willy is sporting a new haircut courtesy of Grandpa Bill. I buzzed him with dog clippers. 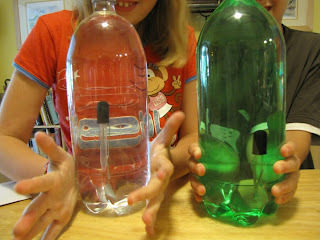 A weighted eyedropper is placed inside a plastic bottle of water and the bottle is tightly capped. At normal pressure the eyedropper floats at the surface of the water. When pressure is applied to the bottle the air inside the eyedropper becomes more dense and the dropper slowly sinks to the bottom of the bottle. They were very excited to show us the marvel. If my explanation was not clear you can see a better explanation HERE. 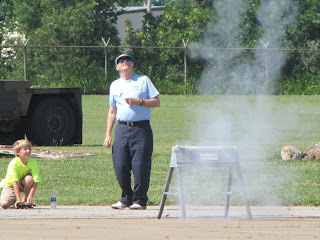 They are doing all sorts of things at the camp including flying in a real airplane simulator. 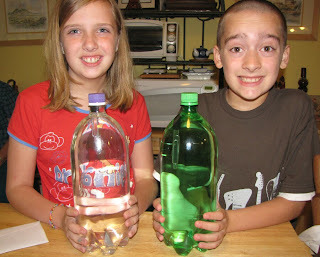 Yesterday they made a simple rocket using an Alka-Seltzer tablet. They put a little water into an empty 35mm film canister, dropped an Alka-Seltzer tablet in it, quickly put the lid on the canister and turned it upside down. The expanding gas blew the canister up over their heads. They said it was really cool. 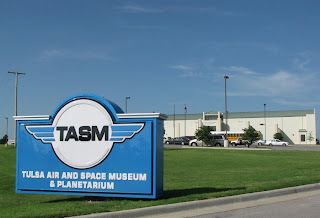 If you are interested in knowing more about the Museum and Planetarium look HERE.